This week The Tucker Center for Research on Girls & Women in Sport put on its Distinguished Lecture Series featuring author and speaker Mariah Burton Nelson (MBN). As the Associate Director of The Tucker Center, I get first hand exposure to the topic and speakers each fall and spring, which is a wonderful benefit of my position. I’d like to share my thoughts from the event and the breakfast panel this morning. My work is focused mostly on the youth end of the developmental trajectory. I am certainly aging, but I don’t study aging or aging populations, so this is a topic I know very little about. I learned a great deal and MBN challenged me to think about reclaiming and reframing aging in new ways. We are ALL aging. It is a process of life and something everyone has in common. Most would like to stay suspended in youthful animation and try many things to achieve that goal, but the fact remains we are aging. We can’t control that we are aging, but we can control how we think about aging and we can do certain things that will improve our quality of life while we age. I laughed when MBN explained that being “Grown Up” according to the AARP was anyone between age 40-65 years of age. She challenged the audience to think about the language we use to talk about aging and how to reclaim and reframe aging. I didn’t know that peak cognitive functioning for women occurs in their 60’s! (for men, their 50’s). When I turned 40, it was very strange that all of a sudden I was thinking of myself as “old”. Why?….40 isn’t old! Where did these thoughts come? I decided to claim being 40 and embrace getting “older”…what was the alternative anyway? So since my epiphany, every time I catch myself thinking about how “old” I am, I replace it with something resembling SNL’s Stuart Smalley affirmations…. “I’m young, healthy, active and I feel great!” In fact optimism and a positive attitude have been shown to improve quality of life as one ages, so perhaps I’m onto something. We will all die and MBN stated that older people (those 80+ years old) are not afraid do die, they are afraid of how they will die. An audience member reiterated that aging is about loss and that life is a series of losses. My take home: We can only control how we react to our losses and how we react in part, will affect our quality of life, including mental and physical health. Another strategy for maintaining health and quality of life is MOVING! MBN cited that researchers have found physical inactivity is a better predictor of death than smoking!! The take home message…MOVE! Move in any way you can and in any way you enjoy. Women over 50 did not have the benefit of Title IX (which thank goodness this week Obama has gotten rid of the survey method for proving “interest”) so some do not enjoy physical activity, didn’t have the opportunity to plays sports, or just don’t know how to move in ways that are enjoyable and subsequently their health suffers as they age. 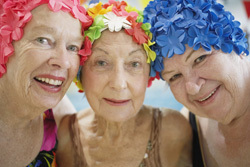 Did you know there are National Senior Games? It is never too late to learn how to move or new ways to move when the former ways aren’t feasible perhaps due to injury or impairments. In fact while I was sitting here I got a Facebook message from some women I know who are playing in a 50+ women’s hockey tournament! Take home messages: move, stay positive, seek social support, and embrace whatever age you are! Thanks Nikki- I liked that! Feb 1, 2011. The Tucker Center Film Festival.